An orientation to affective neuroscience as it relates to educators. In this ground-breaking collection, Mary Helen Immordino-Yang—an affective neuroscientist, human development psychologist, and former public school teacher—presents a decade of work with the potential to revolutionize educational theory and practice by deeply enriching our understanding of the complex connection between emotion and learning. 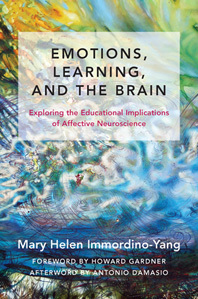 With her signature talent for explaining and interpreting neuroscientific findings in practical, teacher-relevant terms, Immordino-Yang offers two simple but profound ideas: first, that emotions are such powerful motivators of learning because they activate brain mechanisms that originally evolved to manage our basic survival; and second, that meaningful thinking and learning are inherently emotional, because we only think deeply about things we care about. Together, these insights suggest that in order to motivate students for academic learning, produce deep understanding, and ensure the transfer of educational experiences into real-world skills and careers, educators must find ways to leverage the emotional aspects of learning. Immordino-Yang has both the gift for captivating readers with her research and the ability to connect this research to everyday learning and teaching. She examines true stories of learning success with relentless curiosity and an illuminating mixture of the scientific and the human. What are feelings, and how does the brain support them? What role do feelings play in the brain's learning process? This book unpacks these crucial questions and many more, including the neurobiological, developmental, and evolutionary origins of creativity, facts and myths about mirror neurons, and how the perspective of social and affective neuroscience can inform the design of learning technologies.